Mt. 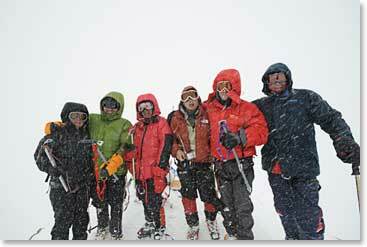 Elbrus Expedition Dispatch: July 1, 2009 – Summit Success! July 1, 2009 – Summit Success! Jackie Berger, Steve Whittington, David Cohn, Winston Chan, John Bank and Vladimir Bakhmutov - The Summit Team on the top of Mt. Elbrus! After a very tiring climb, we are all safely back down in our cabins getting ready for much rest. We boarded the snow cat at 4:30am, already wearing our crampons. We climbed off of the snow cat at 5:15am and started for our summit attempt. Though it was warm when I called you early this morning before we left, it ended up being windy all day and this made the climbing very challenging. 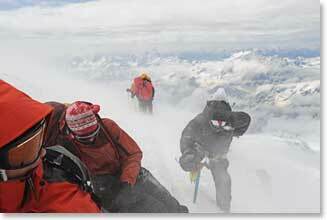 Some of the team were not able to make it and turned around before the summit. Mountaineering elements: high altitude, waking in the middle of the night, snow and high winds make for a challenging summit. The physical and mental strength is at its peak for each climber of this team. Jackie Berger, Steve Whittington, David Cohn, Winston Chan, John Bank, Vladimir Bakhmutov and I reached the summit 11 hours after leaving the snow cat. By 7:30 pm all team members were back in the cabins at Garabashi, where Anastasia had plenty of soup, hot drinks and a special celebration cake she had baked for us. We are all doing very well, but there are some tired climbers around me and we are going to sleep now. Stay tuned as I will report tomorrow with further details and photos from our summit.